Are you looking for this Disaster Plan? Having a Disaster plan in place is one of the conditions to become GDPR compliant with your organization. The EU General Data Protection Regulation (GDPR) is the most important change in data privacy regulation in 20 years. This policy directive was adopted in May 2016 because most Europeans say they want the same data protection rights across the EU and regardless of where their data is processed. It aims to make Europe fit for the digital age. Our organization resources, systems, records, procedures, planning, etc often contain personal information, allowing the users to reach out to the responsible persons to do the job. This is also the case for a Disaster Plan, where staff has to respond quickly to incidents and crises. It may also include other information such as assets tied to people, and so on. Organizational Planning has long been subject to Data Protection regulation, but the wider remit and definitions within the GDPR are something you will need to look at, to check your organization systems and documents - and the way you handle them - will continue to conform under the new rules and regulations. To comply, organizations will have to review their procedures and how to handle data and privacy management across the board. This includes thinking through how to manage data within business continuity, crisis and resilience planning. 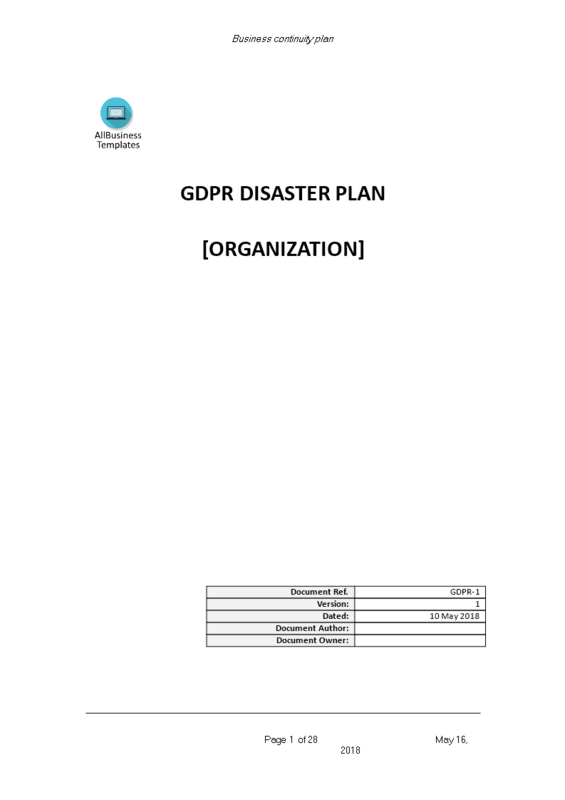 Download this GDPR Disaster Plan now or check out our fit-for-purpose GDPR Complete Compliance Kit templates here! The document(s) will be available to download immediately after purchase.